How Minnesota is bouncing along with the sudden popularity of dodgeball. If you can dodge a wrench, you can dodge a ball," says the man in the wheelchair, seconds before he whips the steel projectile at a player's noggin. The fellow in the chair is actor Rip Torn, playing Patches O'Houlihan in the signature scene from, "Dodgeball: A True Underdog Story." Intentional or not, the Ben Stiller comedy sparked a surge in adult dodgeball participation nationwide, including the Twin Cities. In Minneapolis, the Dodge-It Center continues to hum under owner/marketing whiz Ed Prentiss, who says about 500 players will be involved in amateur leagues there this winter. While the film was a goof on the game, Prentiss, 39, is serious about his venture. Right now, his timetable is for pro tryouts to begin in February or March, with the league (National Dodgeball League) to start play in April. Four franchises are in the mix for the first season-with marketing, broadcasting contracts and everything else under construction. "I get e-mails from all over the country," he said of potential players, with a lot of interest from those with college football and baseball backgrounds. "The people that play are serious about it," explains Prentiss. Serious about dodgeball? Well, we do have the WNBA, after all. Not to mention the Arena Football League. Plus it's one of those niche sports, unlike lacrosse, that we can actually understand. And unlike hockey, there's no second mortgage involved. "It's not like you gotta buy a billion dollars worth of equipment," Prentiss added. Joining a league costs $300 per team at Dodge-It, which Prentiss hopes to branch out to other cities soon. While Prentiss' place is the only spot in town that concentrates only on dodgeball, there are other leagues in the metro. 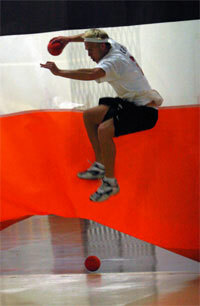 Soccer Blast, a sports facility in Burnsville, also offers dodgeball at the same rate. League Coordinator Matt Tanhaken says a 12-team league (120 players) will play there this fall and winter. "People are really liking it," he said of the playground game. "Maybe adults want to relive their glory days." A. In a 12-player game (two teams of six), there are six balls-four standard (8.5') and 2 "stingers"(5'). B. Players then take a position behind their endline. After a signal by the official, teams approach the centerlines to retrieve the balls. C. Balls must be taken back across the end lines before they can be thrown at an opposing player. If the ball is not taken behind the endline before it is thrown the throw will not count. D. Players then attempt to eliminate members of the opposing team by tagging them with the ball. If a player is hit with any ball that has not yet touched the floor, that player is "out". E. If a defender catches a "live" thrown ball the thrower is out and one player then returns to the defenders side in order of first out, first in. F. If a defender attempts to catch a live ball, but drops it, the defender is out. G. The defender may block a live ball with another ball. That ball is still a live ball however, until it hits the floor, wall or ceiling. H. If a blocking ball is dropped as a result of contact from a live ball, then the player who drops the ball is out. I. A player may block a live ball, then throw the blocking ball down and catch a live ball. J. A player shall not leave the playing field to avoid being hit or in an attempt to catch a ball. K. Headshots resulting from a high thrown ball, result in the thrower being called out. L. Play continues until one team is eliminated. Oh yeah, there are also dodgeball pickup games. This past summer, a 30-something crowd of professionals would meet Monday and Thursday nights near the Kenwood Park tennis courts. John Barton, 36, was part of that action. "There's nothing like whipping a ball at your friend," he said. "It kind of brings you back." In Barton's case, back to the second grade, when he described himself as an "average" player. These days, he says it's great exercise, and simply a nice diversion. "It's one of those things that wives don't understand," he muses. "So it's all the more appealing." Spoken like a married man. But don't think for a minute dodgeball is just a men's club. Co-ed leagues are quite common, with Prentiss promising a women's-only league soon. In fact, he says a priceless sight is watching the face of a strutting male player who suddenly realizes that a ball zooming toward him has been chucked by an former fast-pitch softball star. "They can light it up," Prentiss beams. As for Prentiss' dream, he says he'd love to see a sold-out Xcel Energy Center, with 19,000 rabid, T-shirt-buying fans cheering on the Minnesota Blur in the NDL title match against the New York Empire. Maybe in a few years, Ed. For now, it's one toss at a time, as he grinds out putting together the league. Can he make it? Why not? Surely the craze will spike higher than ever when "Dodgeball II" is released. "All we have to do is make it until the sequel," he joked. Talk about your true underdog stories. The Minnesota Score, Minnesota's premier all sports magazine. Original article at The Minnesota Score magazine.